A victory for Noxian lore. When League of Legends first came out, champions tromped happily over the bright green fields with pizza feet and enormous, clunky hair. As the years have gone by, Riot Games have been slowly returning to old champions to get them up to par. Sometimes, these changes are nice and small. When Twitch had his time under the Visual and Gameplay Update sun, he emerged... well, pretty much the same, just better. Meanwhile, Trundle’s visual update changed everything about his champion except for the ‘troll’ bit, giving him a whole new look, story, and motivation. In the July 2017 Champion Roadmap, we found out the next champion to get a VGU: Swain, the Master Tactician. I remember following Swain’s development avidly when he was first teased. I had just first started playing regularly after Xin Zhao’s release; Swain was the first champion I was cognizant of. At the time, Swain seemed a step up from the other champion designs being released. He entered the Rift in 2010, coming out amidst a sea of pretty ladies (sure, one of them was a snake, but she fits the bill), classic fantasy archetypes like Galio and Trundle, and various monsters. Swain was a character with, well, a lot of character. The way he interacted with his raven, Beatrice, as he stood still. Whereas other champions strode confidently or sprinted, Swain limps along with his cane. He was a neat character. When he came out, Noxians were nearly universally depicted as raiding parties, showing up in other champions’ stories to wreck houses and kill families. Swain was a weird Noxian. He wasn’t strong; he was visibly disabled. He was climbing the ranks, but found himself caught in politics and bureaucracy. Oh, and he could turn into a giant bird and eat people. LeBlanc, the matron of the Black Rose, was released towards the end of 2010. The Black Rose expanded on the politics of Noxus, and added an underbelly of mystics and intellectuals to the underbelly of the city-state. Noxus became about more than showing up as a bad guy in someone else’s story; it started to strike out and forge its own destiny with its own champions who had actual motives and beliefs. These were the pre-retcon days, a more innocent time. The League of Legends was a global government, similar to the United Nations, who prevented outright war by putting on 5v5 show matches between champions. We got our lore through the Journal of Justice, an in-universe newspaper. Swain’s story played out in the pages of the Journal of Justice. He allied with LeBlanc, stole Jarvan IV’s blood, and framed Demacia in a bloody conflict over contested lands. The Demacians were shamed, and Swain walked, er, limped away covered with glory. The previous dude in charge, General Du Couteau (Katarina and Cassiopeia’s dad, and Talon’s mentor), was mysteriously missing. Swain played the game so well, and anyone who could have opposed him was removed. He stepped up as Grand General, LeBlanc whispering over his shoulder as his greatest advisor. The pieces were set for a civil war within Noxus. Swain picked up Darius as his bodyguard, Cassiopeia picked up a wee curse from Shurima, and then... the story fell to the wayside. Three years ago, the lore was retconned to remove the Journal of Justice, the League of Legends, and the conflict that had swept Swain to power. Valoran was starting from scratch. For a while, we didn’t hear anything on Swain... until Sion’s REBORN teaser, which reintroduced us to the Noxian political landscape. We met Grand General Darkwill, a man who was backed by Sion as his Hand of Noxus. Sion, one of Noxus’s greatest heroes, was murdered by Jarvan IV after mowing through an entire Demacian battalion. Darkwill, terrified by the imminent gank he was clearly about to receive, called in the Black Rose, who resurrected Sion. Using the blood of Sion’s killer, Swain calls in Vlad, and the entire gang teams up to perform a blood ritual that will bring Sion back with some degree of lucidity and intelligence. 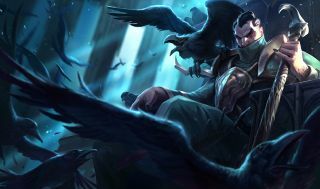 Swain is now sitting in Noxus’s throne with Darius, the Black Rose, and Sion all hanging out by his side. He’s also on friendly enough terms with Vladimir to give him a little ring a ding if he needs a blood sacrifice made. That’s a pretty strong team to go up against! Despite this amazing set up for a story, Riot never really managed to follow through in any meaningful way. Part of this is that Swain is all over the place. He wears green and yellow robes, he has a blue mohawk, and nothing about him really says ‘Noxus’. He has a Grand General skin to celebrate his ascent, but it doesn’t matter how fancy his robes are if no one knows what he is supposed to do. Right now, Swain’s a weird tank drain mage who survives by wading into the thick of battle and just... sitting there. He doesn’t come across as a Master Tactician, a conniving mind, or a brilliant strategist. Everything about his gameplay is centered around being a fat, healing bird. He even acknowledges this in his in-game joke! It’s always felt like Riot was a little embarrassed to really roll out the Noxian High Command lore while Swain was in this state. Now that he has an update on the table, we may finally get the next stage of the Noxus story that started out so strong.